It was Watford's first win in six attempts and lifted them above Wolves into seventh. 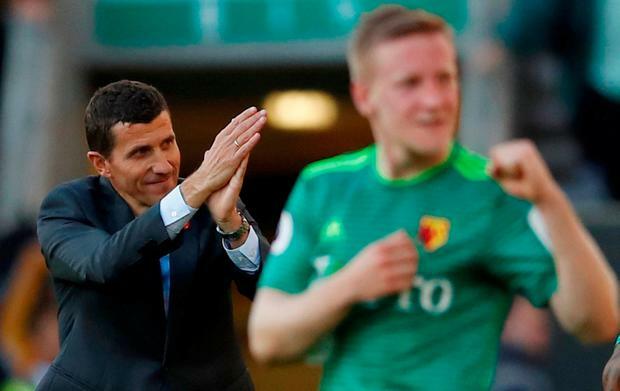 Defeat ended Wolves' six-game unbeaten run as Watford breached a defence which had conceded one goal in their past seven games in all competitions. Ivan Cavaleiro wasted Wolves' best chance in the second half as they slumped to their first home league defeat since January. There was little to suggest the oncoming drama in a sedate start, with only Watford goalkeeper Ben Foster awkwardly tipping Ryan Bennett's header over. First, after 20 minutes, Abdoulaye Doucoure teed up Capoue and the midfielder's 30-yard drive whistled into the bottom corner through Conor Coady's legs without keeper Rui Patricio moving. Wolves, usually so assured, were suddenly ragtag and survived a scare when Willy Boly chopped down Isaac Success, with Watford appealing for a penalty, but Gerard Deulofeu's free-kick hit the wall. But Wolves rarely tested Foster and he gathered Boly's scuffed effort on the hour.